Patients know that they can trust in the team at Monterey County Eye Associates because they offer advanced vision correction treatment backed up by solid patient education. We take time to let patients know how to avoid certain eye problems, and what to look out for should they arise. Knowing warning signs and risk factors is especially important when it comes to conditions that can cause vision loss, such as retinal detachment. With that in mind, let's consider the risk factors and warning signs. The retina is the light-sensitive tissue located at the back of the eye. Light passes through the eyes and focuses on the retina, which sends these signals to the brain. 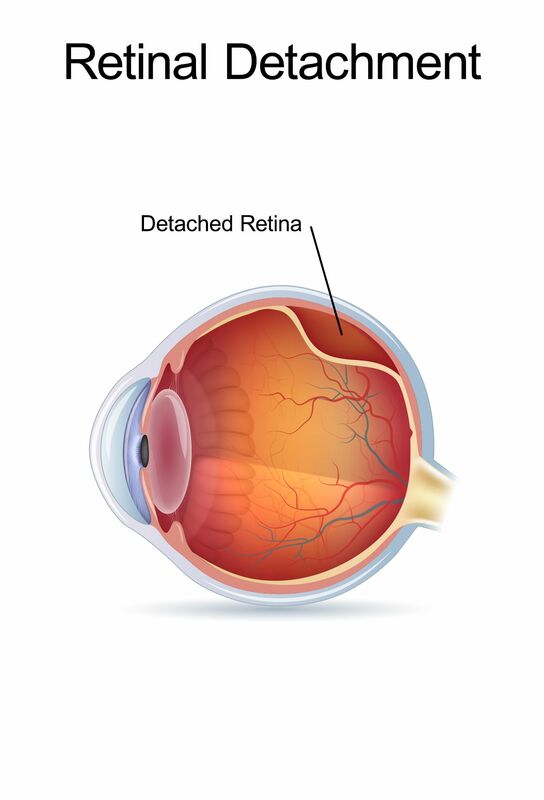 Retinal detachment refers to instances in which damage to the retina result in the retina tearing and peeling away from its normal position. Serious physical trauma, problems with the vitreous gel within the eye, and certain illnesses may cause retinal detachment or tearing to occur. If the retina detaches and is not treated in a timely fashion, a person may experience total vision loss. This can lead to permanent blindness. Flashes of Light – When the retina tears, you may notice brief yet bright flashes of light. This is the sign of the vitreous gel of the eye pulling at the damaged retina. Floaters – Floaters will accompany flashes. These little flecks, spots, and threads in the your vision are solid bits of the vitreous gel, and when many floaters appear in combination with a flash, it's very likely that the retina has been damaged. The Curtain Effect – The curtain effect means a dimming or graying of a person's overall field of vision. This is often a sign of the retina detaching and not functioning properly. If you should notice any of these early warning signs of retinal detachment, seek medical attention right away. The sooner you receive help, the greater your chances of having your vision restored. For more information about treating retinal conditions and improving your overall ocular health, we encourage you to contact our team off eye care specialists today. The team at Monterey County Eye Associates will provide you with information regarding preventative care as well as medical treatments.